Lacquer Lockdown: New Konad Plate Published! If you don't follow Nail Artists United you should! These ladies are very inventive when it comes to creating new images for stamping nail art and even posted about creating their own DIY stamper created from gelatin. That's what I call insanity of the best kind! These ladies have been working very hard to create image plates for stamping and recently hit a wall in getting their plates produced - namely patent licensing issues behind the Konad system. As such they really haven't been able to get their plates off the ground. However they have recently annouced that the Konad UK company will be releasing one of their designs - the Charming Nails Plate (see plate below). How awesome it that! The plate as of now can be purchased from Cesarsshop for 10 euros - you can contact them via cesarsshop@welho.com. 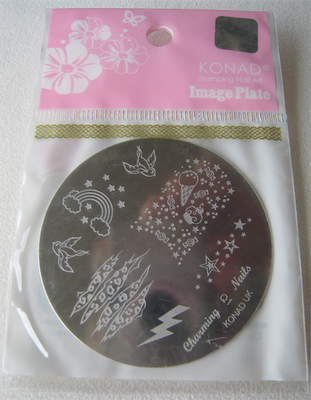 Alternatively, the plate can be added to your order from Konad UK with a purchase of 50 euros or more. If you want to know more information about the plate head on over to Nail Artists United. I for one am gunning to pick up one of these ASAP! How about you? I wrote to Satu, the owner of Cesearsshop, inquiring about the plate and she said that it would be fine to order directly from the site without first emailing. Simply click the UK flag and this will switch the language to english. If you are ordering 1-3 plates select "Letter" shipping for only 1 euro and if you are ordering > 3 plates you will have to choose the "toimitus EU:n sisalli" method for 17.70 euros. Either way the seller is super friendly and it will be relatively easy to purchase here. Visa or Mastercard only payments. Happy shopping!